Κ.Α.ΝΕ. | Feel, Share, Act: RESULTS! The Feel, Share, Act: Youth Empowerment through Intercultural Learning is finished and it is time to share its results! 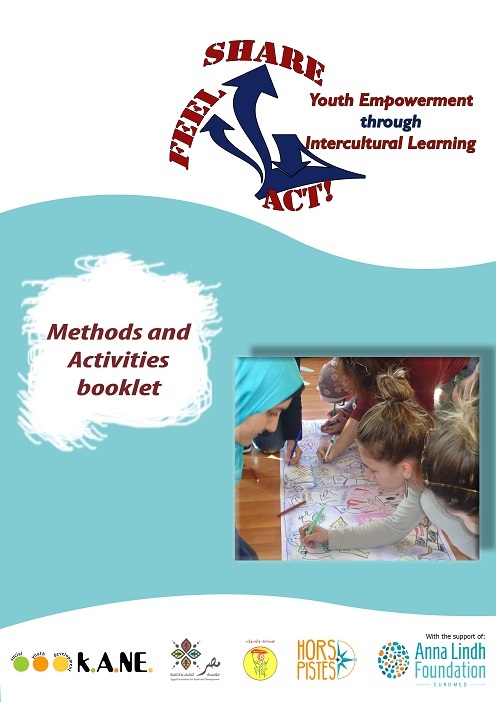 The Feel, Share, Act: Methods and Activities booklet was created as a result of the project “Feel, Share, Act: Youth Empowerment through Intercultural Learning, that was implemented in the framework of the programme ALF/CFP/2015/EDU-ART and co-financed with the support of the Anna Lindh Euro-Mediterranean Foundation for dialogue between cultures. The aim of this booklet is to put together some activities, tools and methods that youth workers can use to promote intecultural learning as a tool for youth activation and empowerment. It starts with some basic information about intecultural learning and effective communication across cultures and then moves on to the presentation of 4 tools/methods that were created during the “Feel, Share, Act: Youth Empowerment through Intecultural Learning” international seminar that took place in Kalamata, Greece from the 14th to the 21st of January 2017. Visit the project’s website: www.feelshareact.org for more information!